The quartet from EQ Accountants in Forfar will take part in the RSABI Great Glen Challenge on Friday 26 August 2016. 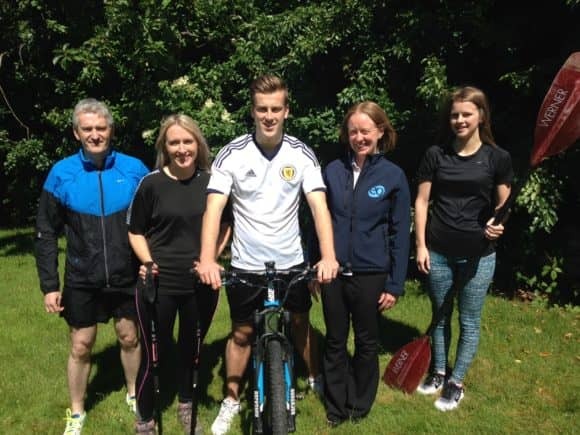 With a route spanning from Fort Augustus to Fort William, the event raises money for RSABI, which throws a lifeline to those who have worked in land-based occupations but who have fallen on hard times. The charity is of great significance to the Forfar office, where many staff work with farms and other agricultural businesses. Each member of the team completes a different discipline, competing against other organisations and professionals from the agriculture sector. Various other accountancy firms, solicitors, banks and land agents will all compete to be crowned the winner. The EQ competitors are Mark McColgan, who will embark on a 17km run, Robert Urquhart, who will take on a 46km mountain bike ride, Anna Coff, who will walk 18km and Kiera McDonald, making a splash in a 6km kayak race. Sarah Millar is the EQ team captain and support driver. In 2015, 25 teams took part, collectively raising over £62,000 for the charity. To sponsor the EQ team, visit http://uk.virginmoneygiving.com/team/EQAccountants or pop into any of the EQ offices (Cupar, Dundee Forfar or Glenrothes). For more information, visit www.eqaccountants.co.uk.